After comparing many different brands and reading customer feedback, we think the 21-litre Sage by Heston Blumenthal Smart Oven Pro is the best mini oven for most people. It’s big enough for individuals and small families alike and its versatility is incomparable. The 30-litre VonShef Black Mini Oven & Grill is the best choice for families that are looking for something large and affordable. If you are buying a mini oven for yourself or 2 people, the 18-litre Dualit 89200 Mini Oven is the best compact mini oven. What is a Mini Oven? Multiple functions including bake, slow cook, keep warm and toast. Convection fan to speed up cooking and spread heat evenly. Multi-functional – bake, roast, grill and reheat. Ultra-compact; perfect for small spaces. 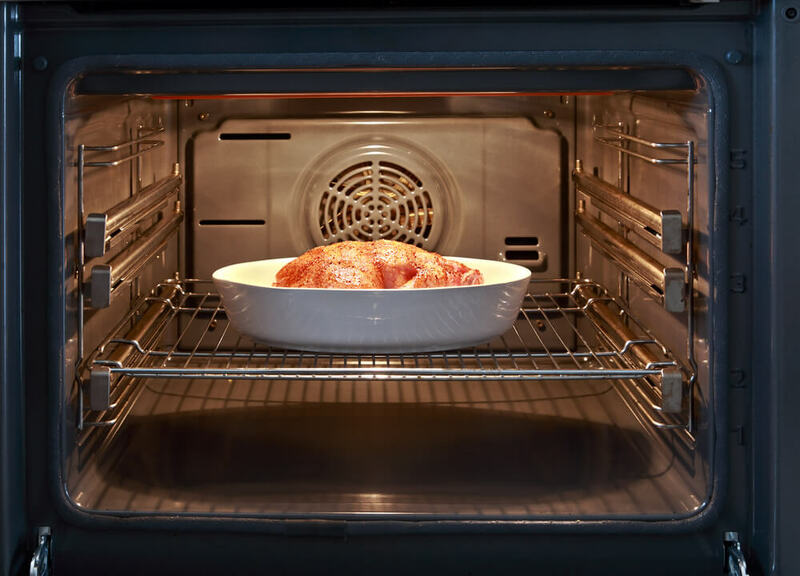 A mini oven can do a lot of the same tasks of a full size oven without taking up much space. Whether you need to bake a cake or cook a full turkey roast, a mini oven is just as good. 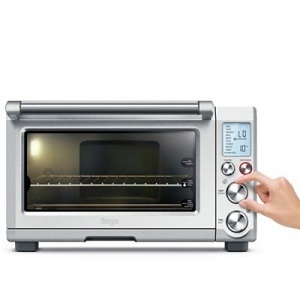 Mini ovens come with three main functions: baking, grilling and roasting. Some have extra ones like toasting, defrosting, reheating and keep warm. A mini oven is ideal when you don’t have enough space or budget for a full size oven. But even if you already have an oven, a mini oven is still a good addition. You won’t always have to fire up the large oven when you just need to grill some sausages, bake a pizza or cook some pork chops or a single chicken. The mini oven is much more convenient and uses less power. Other situations where you can use a mini oven include an RV, boat, camping (as long as there’s power), offices and dorm rooms (where allowed). If you’re in the market for a new mini oven you’ll want to think about what features you’ll need. So let’s look at the pros and cons. Takes up little space on your countertop. Uses less power than a full size oven. Space. You are limited in the amount of food you can cook in it. When it comes to mini ovens there aren’t as many options on the market when compared to classic models. But that’s not to say there isn’t plenty to choose from. Decide how big of a mini oven you want. They range in capacity from 20 litres to 50 litres. If you live alone or have a small family (2-3 people), a small 20-30 litre mini oven will do. For larger families, we recommend an oven that’s at least 30 litres in capacity. If you are looking for something even bigger that will completely replace your full size oven, there are extra-large 50 and 60 litre mini ovens you can buy. As for size, check that the mini oven you are about to buy will fit on your countertop or workspace. Note that mini ovens require 5-10cm of clearance space all around. Decide which functions you need most. At the very basic, get a mini oven that can bake, grill and roast. Other extra features to look for include reheating, defrost, keep warm and toasting. The reheat and defrost features are handy if you don’t have a microwave. Check whether it has a convection fan to distribute heat evenly, whether it has heat direction settings (e.g. upper heat, bottom heat and upper & bottom heat) and whether it has temperature control settings. Check what accessories are provided along with the mini oven. It should at least come with a baking tray and a wire rack for grilling and roasting. A mini oven with pre-set cooking functions is great. You can cook different foods without worrying about undercooking or burning them. If your preferred choice doesn’t have pre-sets, make sure it at least has temperature controls and a timer. If possible, buy a mini oven with a non-stick interior. This makes cleaning so much easier. The racks and trays should be easily removable for cleaning. Here are our 3 favourite mini ovens. They are all easy to use, come with a wide variety of functions and offer versatility despite their compact sizes. Fairly expensive but worth it. There is almost nothing you can cook in a full size oven that you can’t also cook in the Smart Oven Pro. It has three main functions: grill, bake and toast (up to six slices of bread). There are five heating elements spread all around the inside to provide heat from different directions. The oven automatically chooses which elements to use depending on your chosen settings. If you are toasting it heats from the top and bottom. Grilling uses top heat while baking activates all elements to provide even cooking. In addition to these functions, there are 10 cooking pre-sets that guarantee an easy time in the kitchen. And when you are done baking, cleaning couldn’t be easier. A removable crumb and drip tray catches small bits of food. So the oven itself doesn’t get dirty and requires only a quick wipe down. A keep warm function turns on automatically after cooking is done to make sure the food is ready to serve at any time. The best feature of this mini oven is the pre-sets. They include grill, toast, crumpet, bake, toast, pizza, cookies, reheat, warm and slow cook. The slow cook function is perfect for slow cooker recipes. It ranges between 4 and 10 hours. The oven has a technology called Element IQ. It intelligently controls the five elements, determining which heating element is active and how hot it is depending on which pre-set you’ve chosen. It’s essentially fool proof cooking. No more burnt dinners. There is little to criticize in the Smart Oven Pro. The only sorta downside is the price tag. As mini ovens go, this one is quite pricey. But with all the features and functions, it’s easy to see why. This mini oven currently has a 4.8/5 rating. Customers love its versatility, ease of use and spacious interior. The only major complaint is that there is no recipe book. We highly recommend it. Despite the somewhat high price tag, it provides great value for money and is a great addition to your kitchen. The temperature is not very accurate. If you want the largest mini oven you can get without spending too much, the VonShef mini oven and grill is for you. At 30L, it has plenty of space for your roast chicken, pizza and anything else you want to bake, roast or grill. You can easily whip up a big enough meal for the whole family. As I mentioned, there are three primary functions: grilling, baking and roasting. It even comes with a wire rack for roasting and grilling and a baking tray. Depending on which function you are using, you can set the heat to come from specific directions. There is upper grill heating for grilling and toasting, lower grill heating for some types of baking and upper & lower grill heating for baking pizzas and roasting meats. The oven itself is quite compact despite the spacious interior. It’s 49.8cm wide, 40.5cm deep and 32.2cm high. It takes up little space on the countertop. It’s ideal for small kitchens, dorm rooms, small offices and caravans. I love the programmable temperature settings and you are going to love them too. Just by turning a dial, you can set the temperature anywhere between 100C and 230C. This is ideal for most oven recipes. Some customers have mentioned that the temperatures are not very accurate but they are close enough that it won’t mess up your cooking. While we would have appreciated easy cooking pre-sets like those in the Smart Oven Pro above, programmable temperature settings is the next best thing. This is a basic mini oven. It doesn’t have any fancy features or high-tech technology. So you will be limited in what you can do with it. Basic baking, roasting and grilling recipes? Sure. Slow cooking, keep warm or reheating? Unfortunately no. If you just need a mini oven that will do basic cooking, this one will do well enough. It makes up for its reduced versatility with its large capacity. There is also the temperature issue that several customers have mentioned. But don’t worry; it won’t burn your food. The actual temperature varies by very little from the temperature setting. Most customers are happy with their purchase. Many say it’s quite good for its price. It can do the basic oven cooking just as well as a full size oven. Many mentioned the spacious interior which makes the mini oven ideal for families and small offices. 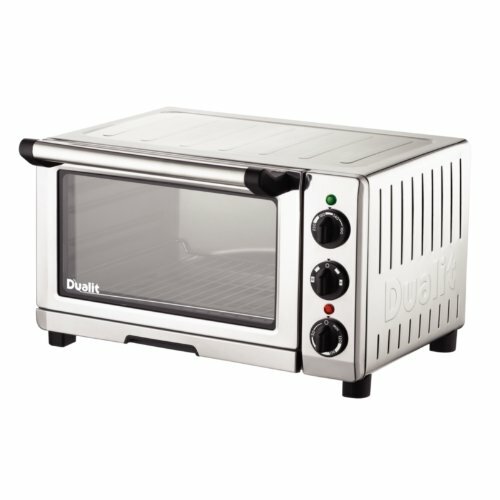 If you are on a budget and need a large mini oven for your family, I highly recommend this one. It’s a great all-round oven that’s easy to use. It’s small. Not ideal for more than 2 people. If you are looking for a mini oven that’s just enough for 1 or 2 people, the Dualit mini oven is perfect. It has a fairly small 18L capacity but the interior is cleverly designed to accommodate larger dishes and pans. The back is curved to fit circular dishes. It’s still big enough to roast a whole chicken, bake a pizza and many other yummy treats including pies, muffins and cakes. It comes with a pizza pan, a removable crumb and drip tray, a grill pan and a wire rack. There is a temperature control dial that goes from 100C to 230C though several customers say it usually goes only up to 200. Below that is another dial for changing the cooking mode. There are four cooking functions: bake, grill, defrost and convection. These are like pre-sets; just set the dial and let the oven do the rest. The bottom dial sets the timer. It runs up to 120 minutes. Once you switch it on, the oven heats up in around 3 minutes. The top gets hot enough that you can warm plates there. Just be careful to keep kids and pets away from it. After you are done baking, cleaning is a breeze. The drip tray slides out for easy cleaning. The interior is non-stick so a quick wipe down is all it needs for cleaning. I love the versatility of this mini oven. It has the basic roasting/grilling/baking functions plus extra ones like defrosting and plate warming. You can cook different foods at the same time, set a specific temperature you want, select the right cooking mode and set the timer. It’s the best compact mini oven you can buy. It’s small but that’s not really a flaw. 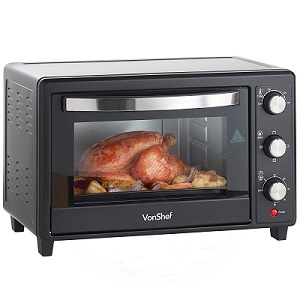 It’s designed to be a compact mini oven ideal for 1 or 2 people. The compact size actually comes in handy if you don’t have much countertop space to spare. One issue mentioned by several customers is that it doesn’t really reach 230C. It will get to 200C and stop heating. But it shouldn’t limit your recipe choice. If a recipe requires higher temperature than 200C, just add the cooking time. Another (minor) issue is that it doesn’t have an interior light. You’ll have to position the oven near a light or use a handheld light to check on your cooking. The lack of a light is understandable considering the limited space inside the oven. Users love it. It’s small but surprisingly versatile and efficient. It fits large dishes and can even cook two dishes at the same time. They love how quickly it heats up and the easy cooking settings. Yes, if you are one or two in the house. It’s also a great choice if you have very limited space in your kitchen, RV or boat.